Pros: A powerful and intelligent script, excellent performance, functional and well-designed set. Cons: The play runs a bit short and couple have benefited from an extra scene or two to cinch the potency of the piece. Our Verdict: Black Jesus is a simply fantastic new work in every way and deserves a high place on your must-see list. Every time I visit the Finborough Theatre, I’m always shocked at the extent to which the intimate space can be so utterly transformed. While I’ve previously stumbled through the theatre’s door into a community centre Bridge classroom and a Welsh dollmaker’s workshop, this week I found myself sweating in the heat of Zimbabwe, knocked back and forth between a dimly-lit prison interview room and an unkempt government office, as Anders Lustgarten’s political drama peeked into the aftermath of Zimbabwe’s humanitarian crisis. 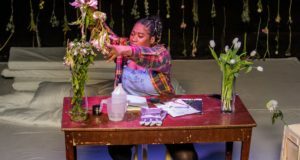 Desks, files, potted plants, and florescent lamps give structure to the vast and epic nature of the play’s concept: a sweeping quest for truth and justice as Zimbabwe rebuilds, set in the not-too-distant future following the downfall of the present regime. Lustgarten’s script posits the Zimbabwean government as a force working to reinvent itself, but simultaneously continuing to hurt its citizens by refusing to admit the havoc wreaked by Mugabe. Two victims of this havoc stand on opposite sides of the law: Gabriel Chibamu, a clever young war criminal who became a soldier under the Zimbabwean regime at a young age, and Eunice Ncube, a member of a newly instated initiative, The Truth and Justice Committee, who is intent on acquiring Chibamu’s honest testimony in order to pursue healing towards a brighter future for her country. Of course, navigating the waters a freshly forming government system in a wrecked nation is no simple task, and both Gabriel and Eunice find the beliefs they hold firmly to be challenged, reshaped, and betrayed as the plot hurls forward. Lustgarten’s tense and meaty script is brought into vivid life by the cast. Paapa Essiedu gives an electric and consuming performance as the title character of Chibamu, known among the militia as ‘Black Jesus,’ apparently for his willingness to make fatal judgements upon victims, and is matched in full by Debbie Korley (Eunice). The pair on stage is captivating, and Korly, present in every scene of the play, steers the action and the mood with poise, precision, and passion. Black Jesus is an emotional and political tour de force, captivating throughout, and so perhaps its most apparent shortcoming is its length. Coming in at an hour and fifteen minutes, Lustgarten’s script definitely had the capacity to keep audiences fully engaged for longer, and I for one would have appreciated a handful of extra scenes to add just a bit more depth and development in order to really cinch the effect of the piece. 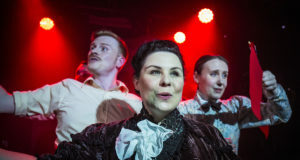 Eunice’s relationship with her white superior deserved more attention, and Alexander Gatehouse being such a delight on stage, further or longer scenes between the pair would have certainly earned their keep. Additionally, the conclusion camer rather quickly, when certainly more of the charged interactions between Eunice and Chibamu could have been utilized to reach a more organic ending. I wish it would have longer, and when that the only complaint, I really can’t complain at all. Black Jesus is a simply fantastic piece of work from Lustgarten, with phenomenal performances and direction, and you have the rest of the month to catch it at the Finborough – don’t miss out! Black Jesus runs at the Finborough Theatre until 26 October.